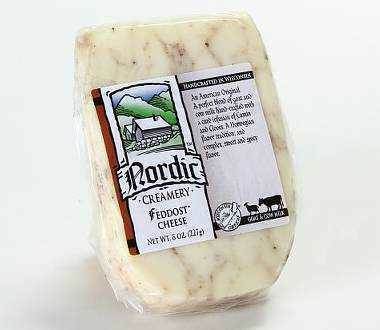 Feddoust is a Norwegian flavor tradition with a sweet and spicy flavor, made with a perfect blend of fresh goat and cow's milk. This unique, handcrafted cheese is derives its strong flavors from a curd infusion of cumin and cloves. Dan at the Wine Guyz Recomends: This cumin and clove infused goat/cow blended cheese would go great with a spicy Australian Shiraz, such as the Morse Code Shiraz, or a classic Cotes du Rhone like Kermit Lynch's Cypress Cuvee. Service Area: Westby, Sparta, Onalaska, West Salem, Milwaukee, Madison, Stevens Point, Fond Du Lac, Chippewa Falls, Rhinelander, Eau Claire and surrounding communities.